Hey, thanks for visiting. I’m Mel, and I’m the face (well when I get my photo organized) and brain behind Little&Luxe. I also have some amazing friends and family lending a hand with ideas for box themes, products and packing, and some fabulous people, who also count as friends, who have given me their ears, time and creative skills. Little&Luxe came about because I love gift giving. I once gave my best friend 30 individualized wrapped presents for her 30th birthday. It was both hilarious and exhausting (all that shopping and watching her unwrap them - it took some time). My life is packed full of family, friends, work, Netflix, chocolate… and once in a while I like to treat myself. 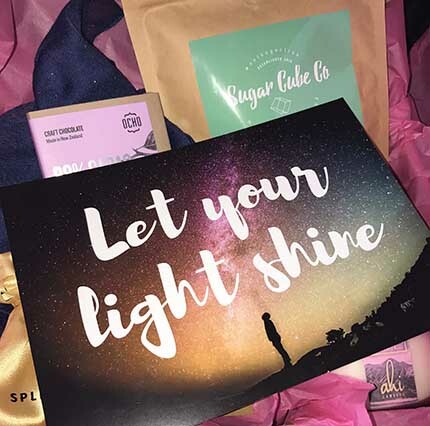 I love the subscription box model, I love getting a surprise every month, and I love finding new and different local products to share with others. When I thought about all the options for a box I could curate, a very good friend suggested lifestyle – and it clicked. So here we are. Right now you’re finding out about me, and if you sign up and fill in our questionnaire, I’ll find out about you – and every month send you a specially curated box. You know you want to! The Luxury lifestyle subscription box curated for you.